With the departure of our guests, our desire to be moving again was becoming increasingly stronger with the passing of every windy day. We consulted every weather source we have and it looked like Monday would be the day to venture out into the Mona Passage. But as the day approached, I realized with mixed feelings that we might be delayed again. Wishing to “take the bull by the horns” and clear up any doubt about it, we went to see Victor on Saturday morning. The weather was still looking like we MIGHT be able to leave the southern Dominican Republic coast and sail up to Samana where we could maybe take that Coffee Plantation tour we missed out on. Victor is an “agent”…. a liaison, so to speak between us and the Dominican Government… His job is to help grease the wheels of Officialdom and advise Cruisers as they move from port to port. It is possible to obtain a Despacho by walking about a mile and a half up the road and getting it ourselves, but Victor can make it happen so much more easily… for a small fee. Boca Chica is one of the ports that I have feared. There are tales of threats and strong-arm tactics being used against Cruisers littering the Internet and I wanted to avoid being another one of them. All during our stay here, we have tried to be the “Model Cruiser”. We have given gifts, we’ve had friendly conversations and we’ve done our level best to spend an appropriate amount of money here so as not to provoke unpleasantness upon departure. The big complaint against the Dominican Republic is that there is corruption amongst the Port Officials. There are the lawful fees collected upon arrival and departure, and then there are the many miscellaneous and cleverly contrived fees collected by reportedly low-paid officers that are not dictated by law, but considered a part of the process. The fees seem to be completely random and sometimes quite high. The way I see it, the country can charge us whatever they wish. We can then choose to either pay it… or skip on to the next country down the road. But my wish is that they would just tell me what the fee is already! Just spit it out instead of putting us through the veiled-threat-process… the excuses (You wish to leave after business hours, no es possible… but for a small gift…maybe), the requests (If you could just give me say maybe ten bucks for gas, I could bring your Despacho to you), the vagaries (No. It is not possible to get your Despacho the day before… unless you maybe give me 500 pesos, then you can have it today). It is exhausting to contemplate just how much we’re going to be jerked around… and you know they talk. If we burn one bridge we’re sunk! I’m sure there will be a phone call made and a black mark put by our name that will cause us eternal pain if we misbehave at any one of these ports. So, we have tried our best to follow the rules and not make waves… and Victor has granted my wish. He has stated that if we would like to leave outside of business hours and would like to have our Despacho the day before departure, we can pay him and he will make it happen. So we did. And much to our surprise, not only did we get our papers a little earlier than promised… he even came out to our boat with it so we didn’t have to go ashore. Just as we were about to climb into the dinghy to go ashore and meet the Port Captain, here comes Victor… and not one, but TWO Officials! My guess is that they wanted to inspect our boat. Supposedly they aren’t required to if you’re just going from port to port within the Dominican Republic. My guess is that maybe they suspected us of going rogue and running for Puerto Rico, instead of continuing on to Samana as stated. I showed the gentleman that we had no undeclared passengers hiding in the closet down below and when we came back into the cockpit where the Captain was holding my Despacho… he asked Victor to ask me why the Gato was not mentioned on my papers!!! WHAT??? I turned to the man and started to babble “Nobody said anything about the cat before…” They all grinned and Victor told me the Captain was just kidding… That’s just what I need. A guy who could clap me in irons for eternity that likes to make jokes. Consider my last nerve officially SNAPPED! But with smiles and waves, they handed over the Despacho without asking for anything else, not even BEER… and motored away. We had prepared for greasing the wheels of Officialdom with a six-pack of el Presidente beer! Remembering the faces of the first Officials we met in the Dominican Republic when I told them we had no beer, I never wanted to be caught without this magical elixir again. But it wasn’t necessary this time so I guess we’ll keep the green bottles cold for our next encounter. We loaded up the dinghy and went to bed in preparation for the early morning departure. Before dawn we were up doing the last few things to get ready. As Bruce loosed our lines from the mooring ball that had been our home for almost three weeks, I breathed a calming breath. My knees were feeling a little weak as I contemplated the next few days. Our weather was unknown and when I last checked, it was looking less and less likely that we would be able to transit the Mona before next weekend. Why didn’t we just stay in Boca Chica until the weather became more promising? Because it was costing us $30 per day to stay on the mooring ball and they would NOT let us leave the ball and just anchor. But still… why would we foolishly go out into the unknown with no place to seek shelter… just to save a few bucks? Our conversation with Victor had given us the information we needed to leave Marina Zar Par. He said that if the weather was not good, we could anchor at any of the stops along the way, even if they weren’t on our Despacho, and they could not lawfully make us leave before weather conditions improved. So before the sun came up we were motoring out of the calm port and into a head on swell that, although wasn’t huge… was enough to make Jezabelle immediately sick as we worked to get our mainsail up to smooth the ride. It was touch-and-go there for a few minutes as we divided our attention between raising the sail and avoiding sliding cat puke… Poor girl. She had enjoyed our inertia and has lost her sea legs once again. Bruce and I were both suffering from a touch of anxiety as we moved away from what was safe and sure. Once again, we are heading out with no control over our destiny and very little idea when and where we would end up. I mentally reminded myself that it’s ALWAYS difficult to leave a place, but once we get going, we remember how much fun it is to be on the move… and today was no different. The seas were not bad during the morning. We set our mainsail and were off the wind enough that we could punch through the four foot waves comfortably. Every now and then we would get a monster that would slow us down a bit, but it was certainly not the worst ride we’ve experienced. The wind blew our hesitation away at a comfortable 12-15 knots and the rising sun glittered on the waves. We shook off the roots that we had grown and began to feel free again! Once underway we listened to Chris Parker’s weather report. As we had feared, deteriorating weather conditions in the Mona now pushed our departure from Isla Saona to at least Saturday. As the morning calm dissipated and wind and waves increased, we tacked out into deeper water to see if the waves were smaller without the influence of the land. As we moved into the greater depths, the wave action was less “confused” but the orderly progression of big swells seemed to get bigger and our speed decreased. It was at about this time that we changed our plan… The additional days now at our disposal gave us plenty of time to check out another south coast anchorage while hiding out from the wind for a day or two… One that is much closer and just up the coast from where we now were… maybe the wind would continue to clock further southeast giving us a lift toward the mouth of the Cumayasa River. We must have done something good… because waves decreased and the winds that had been reaching 23-25 knots gusting to 30 were even back down to a manageable 18-22 G27 knots. We continued riding our lift of about ten degrees until we had to make another short tack out toward the open water. While heading out we encountered a crossing situation with a slow-moving ship… but they passed behind us and never amounted to anything more than entertainment for a short time. Soon, the waves and winds began to build again prompting us to tack back toward land. It would be our last tack of the day as the wind lifted us more and more as it bent along the landmass bringing us to within 5 degrees of our destination. We began to look for the mouth of the Cumayasa River along the shore. Bruce combed the rocky ledges with the binoculars looking for any spot that didn’t seem to have waves crashing. Eventually he found it exactly where it was supposed to be. As we approached, the sea state once again became bouncy and confused. The waves weren’t big, but they were a mess. We discussed strategy for getting the mainsail down and dashing through the entrance of the river which could be dicey with following seas,… We decided to drop the main while still outside the river so that we would have control under power in case we encountered shoaling or underwater obstacles. My knees began to give an occasional quiver as I contemplated my part in this… I would have to guide the boat into the opening with rocky cliffs on either side of us. A swift-moving current could take us onto the rocks… I had to be completely focused. No time for quivering knees! Bruce climbed the mast to secure the main inside the sail-pack while the boat pitched and rolled. I did my best to keep it lined up with the approaching waves, but they were, like I said… a MESS! With his shout that the main was down, I timed our turn to a brief flat spot and came about, increasing engine RPMs to get us up to speed with the waves. We were born through the mouth of the river on a rolling magic carpet. I barely had time to snap a few pictures as we blew past the low cliffs. I have no idea what Bruce was doing during this wild rush… Soon, the rollers began to decrease and become more orderly. I breathed a sigh of relief as things calmed down. We had made it. We were IN! Our search of the shoreline properties suddenly resulted in sighting the now-familiar Marina Guardia Post. They are all painted the same colors, sort of a camel color on the bottom half and a light beige on the top. And they all have the Dominican Flag flying on a pole out front. Bruce waved to the guards as I whipped the boat around just past the six-foot shoal, finding a more comfortable 9 feet just past the guard station. This is where it got a little wacky. While still high from the successful but wild entrance, we welcomed two wiry guys in a beat-up old fishing boat. They zoomed out to us and with my limited Spanish, I deduced that they wanted me to get our Despacho and get into their boat to go ashore. I dashed down below for the papers and, leaving Bruce with his jaw dropped, I was helped off of our deck and into the bounding fishing boat, practically climbing down on the backs of the fishermen… They whisked me away to shore as Bruce tried to tell me something I could not hear… his words were blown away on the wind and the overpowering sound of the outboard motor. I made the effort to communicate with my fishermen with some success during the short ride to a high concrete dock. I pointed to my bare feet and told them I had no zapatos… their smiles said it didn’t matter. We practically smashed into the tire bumpers on the concrete dock and the men scrambled to secure the boat fore and aft while I wondered how I was going to climb up… They grabbed my arms and pulled as I hefted myself up and I’m still not exactly sure how I suddenly found myself on solid ground. 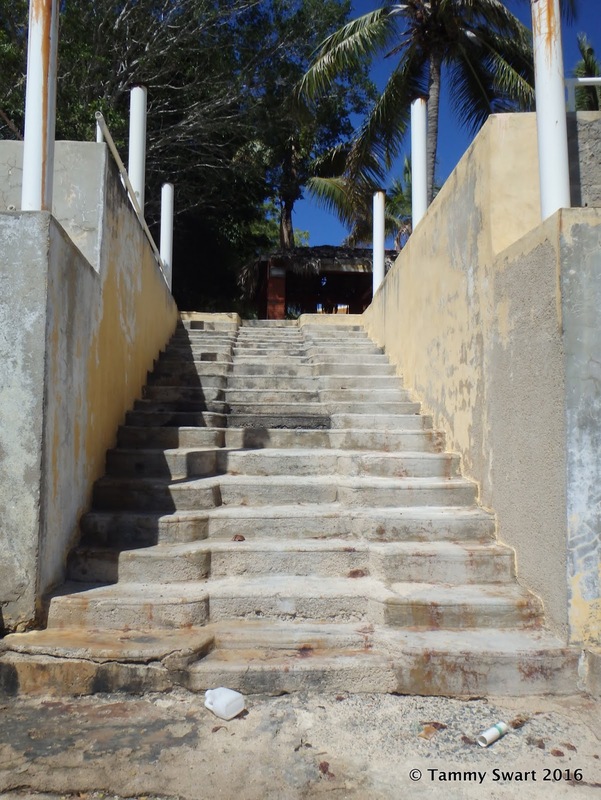 I followed my fisherman up a grand concrete stair, thinking to myself how nice it was. Even nicer was the house I found at the top of the stairway and the pool… although empty, it was really an upscale property and I was surprised that the Government could have such a place to house this out-of-the-way Guardia Post. Just inside the fence beneath the shade of a tree… I came face-to-face with el Commandante. He was dressed in starched camo and had a stern look on his face. I had left my Spanish-for-Cruisers book back on the boat, but I had been studying some things I needed to tell him. So, with barely remembered words I told him that we had left Boca Chica bound for Samana, but had come here to wait for better weather. I speak better Spanish with hand gestures… so with waving arms slapping myself on the head like big winds… and a remembered term from an old television commercial… Con Mucho Gusto… I got my message across as was evidenced by the nodding heads of all present. Yes, the winds were big. Yes we could stay for a day or two until it calms down enough to travel out again… But yes… they would be taking my Despacho away and would give me a new one when we were ready to leave. Oh well… at least they were “powerful enough” to give me the Despacho to Samaná. I shook the Port Captain’s hand and left with my fisherman, back to their waiting boat for my ride back to Dos Libras. Once again, I was helped down the wall into the boat and whisked away. As we approached Dos Libras, I couldn’t see Bruce. I yoo-hoo’d him and he appeared as I was being helped onto the deck… He had two beers in his hands and you should have SEEN the huge grins on the faces of my fishermen as their hands stretched out eagerly toward the beers! Later on as we sat in the cockpit enjoying the cool breeze as it lessened to a more pleasant puff… we were each silently thinking about our day. Bruce broke the silence with the question: “What are we doing here sitting in the middle of some random river in the Dominican Republic?” Sometimes I wonder myself. We marveled at the fact that Bruce had let some strange fishermen come and take his wife away leaving him on the boat to wonder what was happening to me. We wondered how many of the wives of our friends back home would have gone with the fishermen as easily as I had done. I know there are a few… but ONLY a few! And we marveled that such a simple thing as handing a beer to another person could bring such gratification to one’s soul… the gift of beer! The Universal Peacemaker!